First, thanks to those members who turned up to the AGM last month. After a presentation from Bob and Chris, and a question and answer session; the resolution to purchase a property previously inspected by the committee at Kellow Place (or one similar, if this one became unavailable) to replace the current club property was passed unanimously. a find, and fits all the criteria the committee were looking for. Since the AGM, the committee has placed an offer on the Kellow Place property, and we are awaiting a response to that offer. Additionally, we are going through the process to list the club's current property with a local real estate agent, and by the time you read this it should be listed. The forecast was for isolated showers but nobody told the rain it poured all the Saturday night and in the morning as we made our way down the Southern Motorway to the R.S.A. in Papakura, where the run was commencing from. The very large car park had a lake in the middle. No sign of the organizer (may be its been called off) however there is a car there already and gradually more and more appear until Harvey and Val, Bob and Gwen, Chris, Stephen with his father, these people arrive in their club cars, then Brian and Bev, Thelma and Bud, Janice, with moderns plus the organizer John arrived in his club car. Later on Caroline and two flat mates join in a very good turn out considering the weather. We drove off following the instruction sheet across the Motorway bridge, past Wrightsons Bloodstock sale yard complex, towards Clarks Beach following instructions we went down various side roads, up very scenic hills which looked out towards Pukekohe until we arrived at Patamahohe. From there we made our way gradually crossing railway lines etc, to just outside Waiuku, where we drove down a side street to Mr. Sharman’s property. Once parked we made our way to his home where he has an area set up with tables to entertain clubs etc, he put on some very welcome coffee and tea for the group and we also ate our lunch’s which most had brought with them before we all made our way to the first shed which housed the model steam train engine and tender and two very large steam traction engines. Mr. Sharman gave a very informative talk about the model train engine and the traction engines. Then we went to another shed which had some seven beautifully restored cars and were told the history’s surrounding them. After everyone had looked at all the things on display and the numerous posters on the walls, everyone went back for another cup of tea etc, before we all departed our separate way. This run was devised by Chris and Mel and commenced from the old Auckland Railway Station in the Strand in downtown Auckland; it took a bit of figuring out the road lay out into the station as at appears to have been altered. Eventually everyone arrived several going around a few times. After the usual chit chat the papers were handed out, these were in a different format than usual, there were 10 questions, one on each street we were to go along, plus a mystery check point but the streets were not in order, you had to work out the route to take giving what you thought would give you the least mileage. After running around most of the central city suburbs, we all went out to the terrace at the rear of Chris and Mel's and sat in the sunshine. 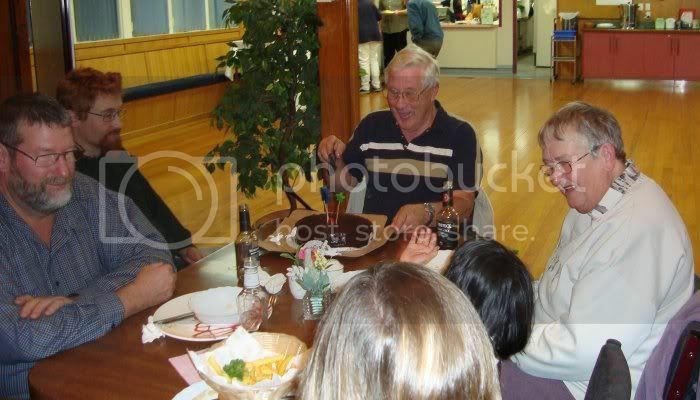 While the men looked at the Prefect under restoration in the garage the ladies chatted, and Mel prepared the lovely buffet lunch of salads and grilled salmon. This was then eaten outside under the umbrella while the guests chatted amongst themselves about the day out. The members who attended with their club cars were, Paul and Delia, Martin, Harvey, Brian and Beverley. Chris also had his car there, Bud and Thelma had their KA as the Prefect is still ill and under repair, and Karen and Ant. After Chris had calculated the winners it came down to mileage driven. The winners were Paul and Delia, Ant and Karen and Bud and Thelma who all received small gifts for their efforts. Concours d'Elegance 2009 was held in the usual place at Ellerslie Racecourse. We turned up a little after the required time, and because of this we had a "special mention" announcing our arrival over the loudspeaker system as we drove through the event to get to our alloted space. The cars generated a decent amount of interest throughout the day, while we variously went and admired the other cars, or sat around eating lunch, drinking coffee and having a bit of a natter. It was good to take a look at vehicles that we as a club don't usually see at the displays that we generally partake in. Those attending were Paul and Delia with their Prefect, Dennis with his Prefect, Chris and Mel, and Ant and Karen with Chris's Y and Martin's Y. 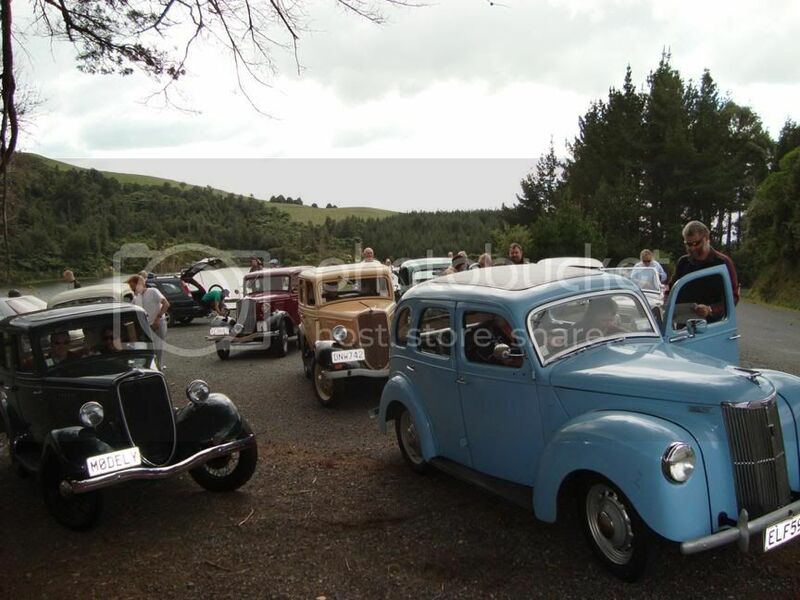 The Lions Car Display and Swapmeet is the biggest day out for the members of the Ford 8 and 10 Car Club of the year. 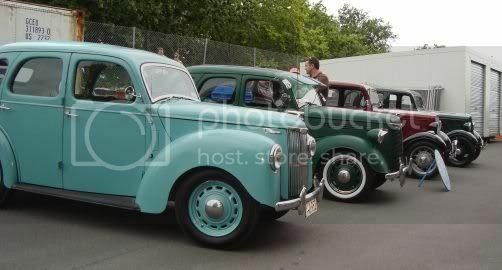 This is the event that all the cars come out to; this year was no exception with a great line up of vehicles. The cars are supposed to be on site by 9.45am, some came a little later, ours did not come at all as its engine is still on the garage floor awaiting diagnoses of the funny noise it has acquired. Most people after the Gazebo is erected place their chairs in its vicinity for the day, then wander off looking at the other cars, Motat display halls where a lot of planes reside, the swapmeet, there is a band playing near the swapmeet, and other stalls, various expensive ice-cream and food outlets. The steam train makes small journeys back and forth blowing smoke everywhere but the children young and old seem to enjoy riding on it. The Trams now also goes back and forth between the two Motat areas and are well patronized. The first monthly meeting of the year takes place and all members present are welcome to take part. We see many of our members there during the day this year I saw Noel and Terry, and the Chaplin's, I did not spend as much time on the site as usual as Catlin my granddaughter came with us and wanted to see everything three times over. This was a nice day the sun shone and the wind stayed away, there are things to do and see and no one is bored (as far as I know). 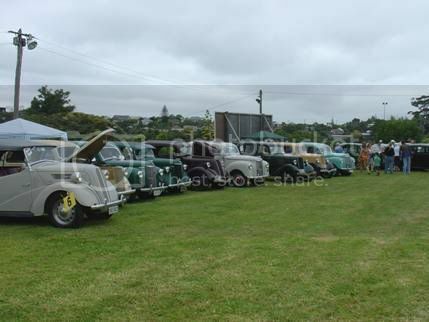 This was the final club outing for 2008 there is the Kumeu Classic Car Meeting this month but your club car is essential as it is a display meeting. It was the meal at the Gengis Khan Restaurant at Ti Rakau Drive East Tamaki on Saturday 13th Dec.
One member mistook the date of the event and phoned the following week to ask about it, and was disappointed to find it had taken place already. 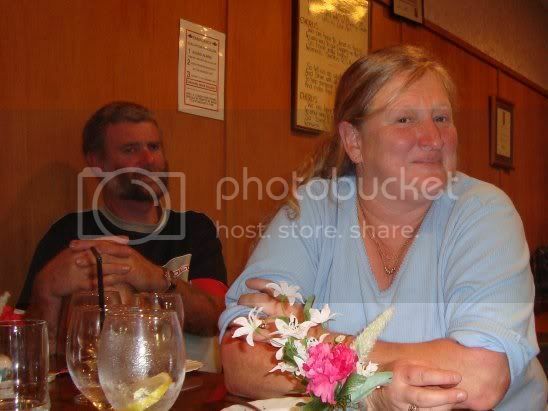 Those who did make it were John and Janice and two of their grandchildren; Ant and Karen; Paul and Delia; Brian and Beverly and Bud and Thelma. The food was nice especially the broccoli soup, most people had several small meals to get the different flavors available in the main meals. The dessert was pancakes with ice cream of your choice. Coffee was also available with the meal. Bar services were there for those that wanted it. 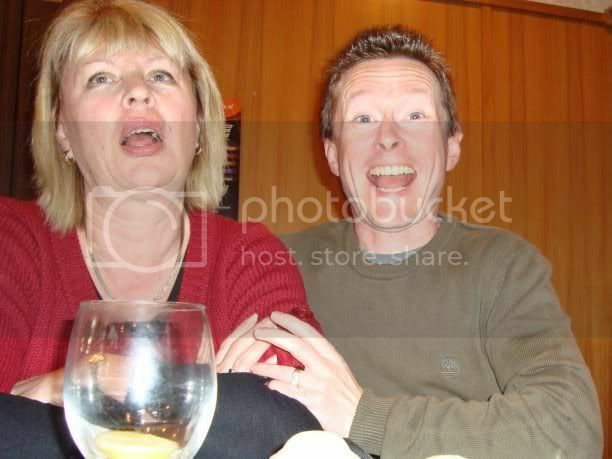 After the meal every one chattered for a while, John and Janice left early to get the children home.